There is a giant steer inside the Hyde Park Art Center. Its hulking shape sits curled up in one corner of the room, filling it, and its curved spine grazes the second-floor balcony. It peers with subdued curiosity at entering visitors, its head resting languidly above its haunches. A patchwork of speckled gray carpet padding forms its hide, while a tangled skeleton of blonde plywood planks supports it from within. But this big, inert mass is not a carcass; the steer is undeniably alive. Children dart in and out of openings in its sides, and the sounds of music and chatter that escape from its belly set it alight with energy from within. This piece is aptly dubbed “The Beast.” It is the work of artist John Preus, who led the design and construction of the Dorchester Projects, Archive House and works as the lead fabricator for Theaster Gates. 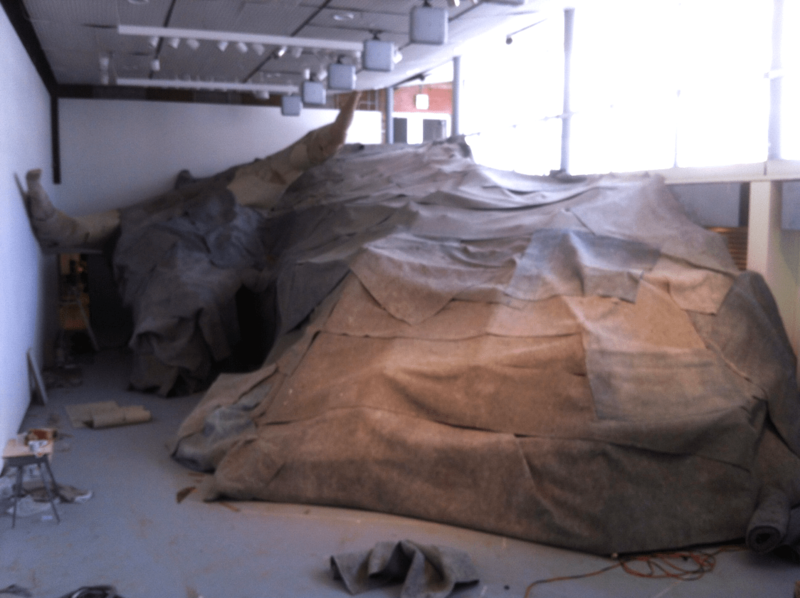 He built “The Beast”—after two years of rumination and ten days of construction—as a community space, looking to historical notions of the steer as something that can be alternately unifying and destructive. Like these found-object instruments, much of the material that composes “The Beast” is salvaged. Preus found its carpet padding skin in a dumpster near a high-rise that was being rehabilitated, and the smattering of chairs and tables housed within the piece are relics from closed Chicago public schools. By using these found objects, and by funding the construction of “The Beast” through a Kickstarter campaign, Preus deliberately engages with his audience and community through his artwork. This is the central aim of “The Beast.” Its most concrete goal is to promote a community-centric idea of art, in which art pieces catalyze interactions between varied groups of people and foster collective experience. In short, “The Beast” is important not because it is conceptually complex, but because it is an alluring novelty. On opening day, the gallery drew a diverse crowd, most of whom seemed unperturbed by the conceptual opacity of the piece. Other viewers, too, expressed a mix of gleeful awe and confusion toward the piece. They were satisfied simply to experience the absurd creature, to delight in its strangeness. That they did this together, as a community, was all that was necessary to make the piece a resounding success. In the coming weeks, “The Beast” will further engage with the community by hosting a variety of events, including youth art workshops, storytelling competitions, small-scale theatrical performances, and lectures. It may seem contradictory that an ostensibly sinister beast could be home to such festivities, but that’s the point. It isn’t strange that “The Beast” is a success; it’s successful because it’s strange.